Can You Put an Air Conditioner in an Enclosed Porch? After the installation of an enclosed porch, you can hook up an air conditioner to cool the area just like any other part of the home, so long as a few requirements are met. Window and portable unit air conditioners are good models for the job. Before installing an AC unit in an enclosed porch area, be sure it's properly sealed. Before window unit or portable air conditioner can be installed in an enclosed porch, you must confirm that the unit's electrical needs can be met. A power outlet with the proper voltage must be installed near the intended placement of the unit to meet its electrical needs. The unit should not run on an extension cord, as the cord might not be able to carry the proper power load to the unit, and the connection of other appliances to the outlet should be avoided, as the added power demand might overload the circuit breaker, causing it to trip. 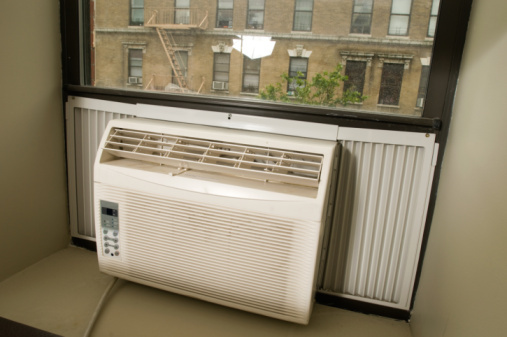 Whether the selected air conditioner unit is a portable unit or a window unit, the unit must be able to exhaust into outside air. Yes, it's technically possible to run an air conditioner unit without ventilation, but air exhaust is dirty as well as hot, which counteracts the cooling effect of the unit. A window unit can either be installed inside of a window or an opening created to fit the unit in the structure of the enclosed porch. The back part of the unit is exposed to the outside air, while the front sits inside of the porch. A portable unit can also fit in a window, or at least, requires an opening in the enclosed wall as wide as its ventilation hose. It's almost pointless to install an air conditioner in an enclosed porch, if the enclosed porch isn't airtight. After the enclosed porch is properly sealed and inspected for leaks, the window or wall opening around the air conditioner unit must be properly sealed. You can use weather seal strips around the unit inside the window or seal the unit into the wall with the sealant of your choice. Like air conditioner units installed inside the home, an enclosed porch air conditioner needs to be secured to the walls of the porch to prevent theft and the unit from falling. L brackets come with most units and can be fastened to the top of the open window to prevent it from opening. This applies to both a window and portable unit. L brackets can also be used to secure a unit that is inserted into the porch wall.